Today, the world's civilization is moving so fast. The transformation not only covers one country but intersects unlimited connections. At the World Economy Forum (Davos 2016) discussing the Mastering the Fourth Industrial Revolution known as the Industrial Revolution 4.0. Humans will integrate the digital economy to manage resources, economic, and social. The company will develop smart factory that makes the machine and the robot as a human substitute to work. Corporate leaders will flock to smart services. Machines and robots can replace some of the CEO's roles in making business decisions, such as estimating market prices, understanding consumer demand, designing a product, finding new markets, and so on. Industrial Revolution 4.0 illustrates the complexity of competition that our children will face in the future. Competition is no longer human. Human quality will be faced with machines and robots that have a fairly high accuracy. In the WEF forum (World Economy Forum) it is explained that there will likely be a reduction in the number of workers in 2020 by 5 million as the impact of industrial automation. Although the new economic demikan will give birth to employment for 2.1 million people with the requirement to have mastery of technology and Complex Problem Solving is high. 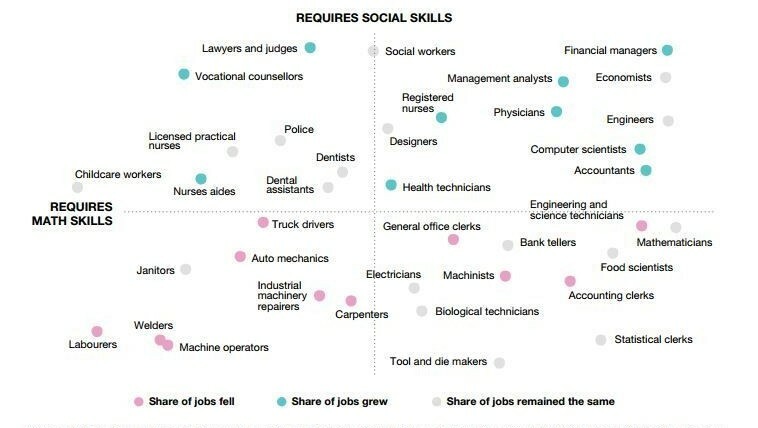 Here we can see the development of the types of jobs that will be lost and replaced with a new job. With such a rapid development, it is necessary to attempt to narrow the resulting outcome profile gap. Paradigm and learning methods must be developed in order to be able to answer the expectations of competitive human resource needs that can be perperan in the global arena. 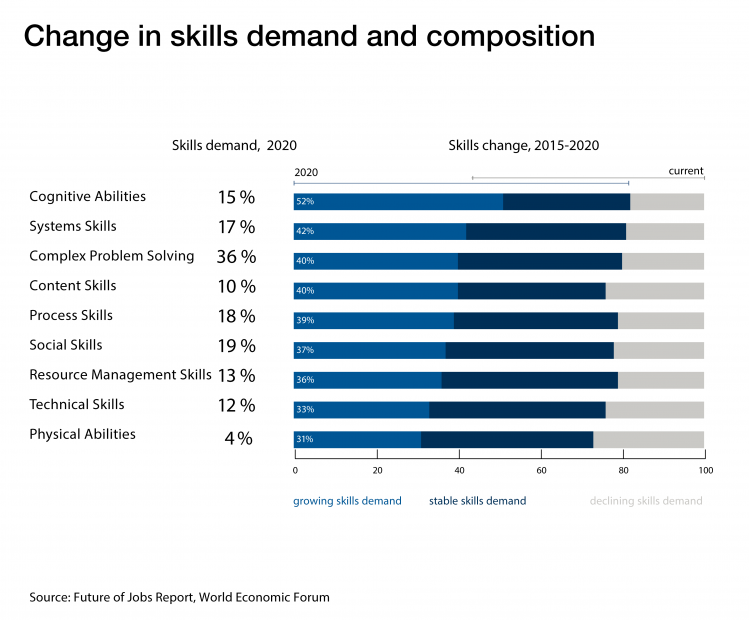 The following changes in the composition of skills needed in 2020. Changes in global conditions provide a challenge for Tazkia in preparing for education at the upper secondary level, namely SMA Tazkia IIBS. If the concept is carried at the junior level is Holistic, then the high school level will carry the concept of Holistic and Personalized. Practically the concept of Personalized means students will be given a program of majors (specialization program) that is not only based on their interests but also the results of career counseling according to the work plan to be occupied. The courses offered are also different from the schools in general. The department is a research that has been done by involving various practitioners, ranging from business, professional, ulama, corporate and organizational leaders, academics, and prospective guardian santri. From the program of majors it is expected that the ability of students associated with Mindset, Skillset and Toolset will be honed from an early age in accordance with the areas of interest. "Printing a cadre of scholars' who possesses extensive scientific qualities and depth, high moral integrity and inspiration that can be a honey of civilization in the midst of society." Study of Islamic Law Development : This subject explains the history of the formation of Islamic law (tasyri ') and its development, since the Prophet Muhammad (peace be upon him) until the time of khulafa ar-rashidin (1st year of Prophethood to 41 H). Prophetic Leadership and Management of Da'wah : This subject explains the foundations of da'wah in al-quran and hadith, musthalahat da'wah, and method of da'wah. (Wide Da'wah Management). History of the Development of Madzhab : This subject explains the history of the birth of the jurisprudence of Islamic jurisprudence (Islamic law), especially the four madhhab known to Muslims (Hanafi, Maliki, Shafi'i and Hanbali) along with the foundations used by each madhhab. Strategy and Communication of Contemporary Da'wah : This subject explains the challenges and strategy of propaganda from the time of prophethood to the modern era. Renewal of Islamic Law : This subject explains the methodological reform in the establishment of Islamic law with the establishment of fatwa institutions. Study of Da'wah Organization : This course describes the da'wah organizations that exist in Indonesia and the methods and strategies it uses. Qawaid Fiqhiyyah : This subject explains the rules of fiqh used by scholars in establishing a law such as the rule of "al-umuru bimaqashidiha" (a matter seen from its meaning), or the rule "or" al-yaqinu la yuzalu bisy-syak "(Confidence does not can be changed with something in doubt), and others. Hadits : This subject explains the thematic hadiths, both related to aqidah, Islamic law (shariah) and morals. Faraidh (inheritance law) : This subject explains the Islamic law relating to the distribution of inheritance. Fiqih Contamporary: These subjects explain about contemporary issues in Islamic law such as baby tube problems, online buying and selling, online games, breast milk banks, etc. History of Islam in Indonesia : This course explains the history of Islam's entry into Indonesia and its development. Arabia : This course is devoted to preparing students for Arabic examinations for Arabic. Intagrated Qur’an and Islamic Studies Project : This subject explains the project / task of scientific papers on al-quran and Islamic studies. Building a Muslim entrepreneur who has value & belief in Entrepreneurship (competence, values, behavior, and entrepreneurial thinking) with the competence of Advantage, Creativity, Ego (the ability to make changes), Team (ability to work with other people). Entrepreneurial Mindset: Changes in the mindset are the main goals implanted early in the education period. These subjects impart the importance of Entrepreneur Mindset to the students. Students will be taught how to build the character of an entrepreneur self capable of creative thinking, able to solve problems and innovative thinking. Entrepreneurship-based education is mindset, skillset, and toolset to make solutions, right for the surrounding community. Technology And Innovation 1 : These subjects provide a broad spectrum for learners about the role of technology and innovation in various areas of life as well as important issues related to innovation development. These subjects also discuss the development of technology and trends in the future. Technological trends and innovations in various sectors (ICT, biotechnology, renewable energy, nanotechnology and others) are provided to equip students into technology-based entrepreneurs. Through group projects, learners are trained to identify and analyze systematically and critically technological innovations within a product. Technology And Innovation 2 : This Technology and Innovation Course 2 gives students an idea of the ideal processes in developing a new product, from the idea generation stage to the launching stage of a product. In this learning process, learners are equipped with theories about the Stage-gate process and are led to simulate the processes of each Stage and Gate through a continuous group project throughout the semester. Until the end of the semester, learners are expected to be able to produce prototypes and documents relevant to the products they develop. Creativity And Innovation : These subjects will explore a broad perspective of creativity and innovation and are applied to individuals, organizations, businesses and communities. Learners will learn techniques and methods to improve their creative and innovative thinking skills. The purpose of this course is to stimulate the design of each student's creative and innovative plans by synthesizing their lessons from literature, classroom learning and group assignments. Social Entrepreneurship and Innovation : Social entrepreneurship focuses on alleviating social problems with an entrepreneurial approach. This field is growing rapidly and attracting the attention of many people. This module is designed to inspire learners and increase awareness of the role and importance of social entrepreneurship, especially in Indonesia. In these subjects, learners will design, create and develop business-based social projects in response to the surrounding social issues. 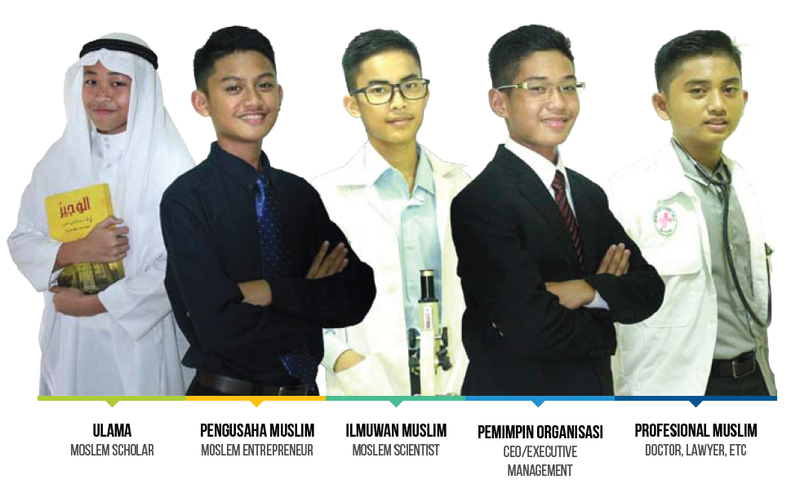 Moslempreneur : This lesson imparts the importance of Islamic values to the spirit of running a business, students will be introduced to how Rosululloh figure and the story of other friends as an entrepreneur. SIswa will be taught about the case studies of fiqih muamalat that is directly related to entrepreneurship. Creating New Venture : These subjects are designed to teach learners the process of creating new "venture" from idea to launch. The term venture here not only focuses on how to create a new business, but also how to guide learners to achieve the ideals of his career by starting in the entrepreneurial venture. The concept of this subject is more emphasis on individual mentoring approach to the learners, by directing in achieving a career that aspired in accordance with the passion and competence. These subjects not only teach knowledge about Entrepreneur, but guide learners to become an entrepreneur. Integrated Entrepreneurial Project : This course focuses on the process of new venture creation based on technology. Learners will apply techniques and methods of creating opportunities to how to develop ideas into a business that has an impact and sustainability. Learners will design, create and develop technology-based business projects as a response to the world's fundamental problems. These subjects are designed so that learners can not only apply the knowledge they get, but also honed as a problem solver, decision maker, creative and innovative with holistic science thinking. Integrated Entrepreneurial Project (2) : This course is a continuation of the Integrated Entrepreneurial Project. In this learning process will focus on how the development and execution of business ideas that have been developed. These subjects are designed so that learners can not only apply the knowledge they get, but also honed as a problem solver, decision maker, creative and innovative with holistic science thinking. "Creating a global Muslim scientist who has the competence Collaborative, critical thinking, Logical Thinking and scientific in solving a problem." Sciencepreneur Mindset : These subjects will be taught to build student character such as care, critical and sensitive to problems around (intrapreneur). The student's ability will be honed either mindset, skillset, and toolset as a sciencepreneur. Students will be implanted that a scientist not only creates discovery but also is able to share benefits to others. Systems Thinking : These subjects will explore how students learn techniques and methods to improve systemic thinking skills. With Systems Thinking students will see the system through a wider perspective (Holistic). So that the mindset of students more accurate and realistic in analyzing a problem. English for Science : These subjects will develop students' ability to understand and use specific terms or vocabulary used in the branch of science. Students will learn and understand the vocabulary, structure and use of English that can be found in academic textbooks, science articles and learning. Science and Technology : These subjects are structured to provide historical insights and new discoveries in both science and technology from the simple to the latest. Students will also be required to explore thoroughly and present discoveries in existing science and technology. This is a means of motivation and development of "scientific thinking" for students. Science Literacy : These subjects will build awareness and develop students' ability to be critical of the truth of the news, analyzing data and reviewing scientific articles. This lesson will also teach how to communicate it in the form of papers and posters and oral presentations in a scientific and interesting way. Creativity and Innovation : These subjects will explore a broad perspective of creativity and innovation and are applied to individuals, organizations, businesses and communities. Students will learn techniques and methods to improve the ability of creative and innovative thinking. Sustainable Futures : These subjects are aranged with the exposure of ecological concepts and environmental issues from the point of view of related science. The main purpose of the delivery of this subject is to build students' sensitivity to environmental problems and the relationship between humans and their environment. This subject focuses on the concept of real-life issues. Students will be taught to explore the root causes of the surrounding environment to discuss world issues and formulate appropriate solutions. Creating New Venture : These subjects are designed to teach students the process of creating new "venture" from idea to launch. The venture process is focused on how to guide students to achieve goals in their career by starting on entrepreneurial ventures. Qur'an & Science: This course is designed to examine the scientific facts that are written in the Qur'an. Integrating science knowledge with the Qur'an from various sources. So as to grow consciousness of Allah Subhanallahuwata'ala. Integrated Sciencepreneur Project I : This course focuses on the process of product innovation in the field of science. Students will apply techniques and methods of creating opportunities to how to develop ideas into a product that has benefits for society. Integrated Sciencepreneur Project II : This course is a continuation of the Integrated Sciencepreneur Project I subjects. In this learning process will focus on the development and execution of the planned product idea. "Building a global Islamic leader with people management, decision making and resource management capabilities effectively and efficiently"
Prophetic Leadership & Policy Making : These subjects will be taught students how to develop character as a Muslim leader in an organization (islamic intrapreneur). Ability and stages in making a policy within an organization. System Thinking : These subjects will explore how students learn techniques and methods to improve systemic thinking skills. With Systems Thinking students will see the system through a wider perspective (Holistic). So that the mindset of students more accurate and realistic in analyzing a problem. Organizational Change & Development : In this lesson students will learn how to make changes and develop the organization, understand the positive and negative impacts and anticipatory steps in making changes. So it can increase the organizational capacity both internal and external functions. People Management : In this lesson students will learn about how to manage relationships and the role of human resources (labor) efficiently and effectively and can be used optimally so as to achieve organizational goals. Customer Journey : In this subject the students will learn about how to analyze the stage of the consumer process in obtaining and using goods / services. Technology and Innovation : These subjects provide a broad spectrum for students about the role of technology and innovation in various areas of life as well as important issues related to innovation development. These subjects also discuss the development of technology and trends in the future. Technological trends and innovations in various sectors (ICT, biotechnology, renewable energy, nanotechnology and others) are provided to equip students into a technology-based intrapreneur. Communication Skill : These subjects practice the students' speaking skills or rhetorical arts. This speaking skill is a means of communication with spoken language including the process of conveying thoughts, ideas, ideas with the aim of reporting, entertaining, or convincing others. Family Business : These subjects will learn about how to manage a family company, especially in terms of leadership, management, mechanisms, opportunities, constraints, and family business development. Financial literacy : In this subject, students will learn how to manage finances in planning, obtaining, managing and reporting financial resources in an accountable and effective manner. Strategic Thinking & Planning : These subjects are designed to teach learners to analyze and develop an effective strategic plan within an organization. The strategic planning process will also be integrated into how to guide learners to achieve their career goals by starting with entrepreneurial ventures. Internship & Integrated CEO Project : These subjects focus on the process of creating innovative products according to the field of business that students are interested in. Learners will collaborate with other majors to develop ideas into a business that has an impact for society. Internship & Integrated CEO Project II : This course is a continuation of the Internship & Integrated CEO Project. In this learning process will focus on how the development and execution of the product idea has been developed. "Realizing Muslim professionals who uphold ethics and work culture, have a high internal motivation, collaborative ability and adoptive to the latest technology so as to inspire"
Intrapreneurial Mindset : These subjects will teach how to build the character of an intrapreneur who can solve problems creatively and innovatively. The student's ability will be honed either mindset, skillset, and toolset as an intrapreneur. Systems Thinking : These subjects will explore how students learn techniques and methods to improve systemic thinking skills. With Systems Thinking students will see the system through a wider perspective (Holistic). So that the mindset of students more accurate and realistic in analyzing a problem. Students will be provided with case studies by learning from professionals in a particular field to practice systemic thinking skills according to the profession. Moslem Professional And Business Ethics : This lesson will explore how ethics become a Muslim professional, the work ethic of a Muslim. By maintaining ethics and professionalism will foster trust that makes it easier for someone to communicate and behave in menjalanakan a profession. Students will be provided with case studies by learning from professionals in a particular field to recognize the code of conduct of ethical codes of various professions. Teamwork and Collaboration : This Subject will explore how students build a team, the stages of team building and teamwork. Personal Marketing : These subjects will guide students to introduce, influence and persuade to others and or organizations that they have the required competencies and capabilities through various media. Technology And Innovation : These subjects provide a broad spectrum for students about the role of technology and innovation in various areas of life as well as important issues related to innovation development. These subjects also discuss the development of technology and trends in the future. Technological trends and innovations in various sectors (ICT, biotechnology, renewable energy, nanotechnology and others) are provided to equip students into a technology-based intrapreneur. Students will be provided with case studies by learning from professionals to introduce the latest technology used in certain professions. Financial and Invesment Literacy : In this subject, students will learn how to manage finances in planning, obtaining, managing and reporting financial resources in an accountable and effective manner. Professional Road Map : These subjects are designed to explore students to recognize their potential, determining professions that match their potential and interests. Students will be given the tools to arrange the steps in realizing the chosen profession. Internship & Professional Project : This course focuses on the process of creating innovative products according to the field. Students will apply the techniques and methods of idea creation to how to develop ideas into an innovation product that has an impact on society. Internship & Professional Project II : This course is a continuation of the Integrated Professional Project subjects. In this learning process will focus on how the development and execution of the product idea has been developed.